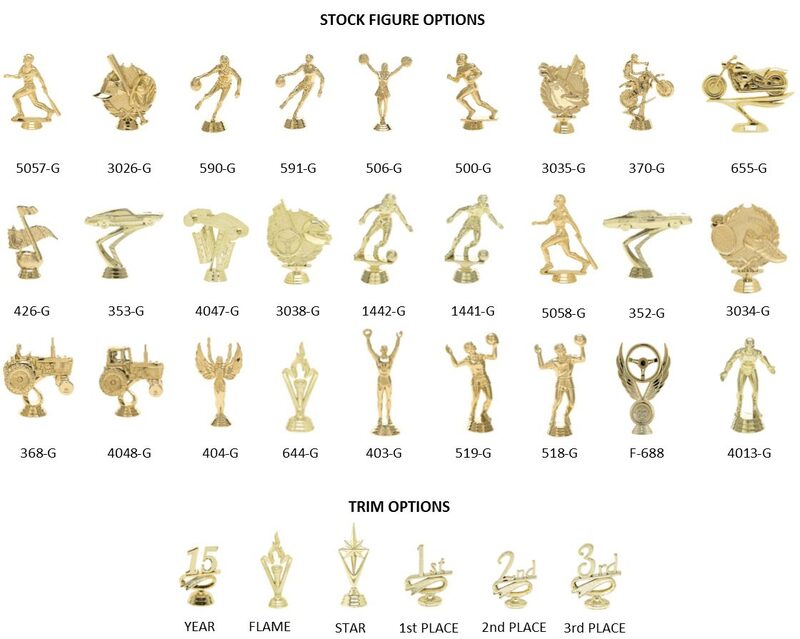 This discount trophy set is a great way to save money on awards for your next event. Whether you’re finishing off a sports season, looking for a unique gift, awarding employees, or hosting a car show, this set is sure to impress. The trophies included in the set measure 24”, 19”, and 13”, respectively. The kit comes ready-to-assemble or partly assembled, and we offer a wide variety of customization options so you can give a personalized trophy that will be cherished for a lifetime. Choose whether you want 1st, 2nd, and 3rd place trophies, or three of 1st, 2nd, or 3rd. We make ordering high-quality trophies fast, fun, and easy—not to mention affordable. With over 30 years of experience, we’ve learned how to reduce our overhead manufacturing costs while still maintaining the level of quality for which we’re known. Our dedicated customer service team is standing by to assist you with your order. If you have a tight deadline, a special request, a bulk order, or any other sort of inquiry, just give us a call at 866-282-0847 or send an email to sales@trophyoutlet.com. Make your next event truly memorable with our discount trophy set. Order stunning awards for less at Trophy Outlet today. Click the button below to add the SET E to your wish list.